I’m very out of touring shape. The muscles I use to stabilize my loaded bike are underdeveloped right now, so I’ve spent my first few days on the road wobbling around and just trying to get my balance again. I huff and puff a lot, not yet trusting myself to really get up out of my saddle and get after each hill. It will come, sure. But for these first few days, I have been exhausted. Riding a 70+ lb bike for 6-7 hours a day is something that I don’t really do unless I have to. Surprise, surprise, a few laps of Hains point on a road bike after sitting at a desk all day doesn’t really train you for riding this bike. Settle in. It’s a long road ahead. 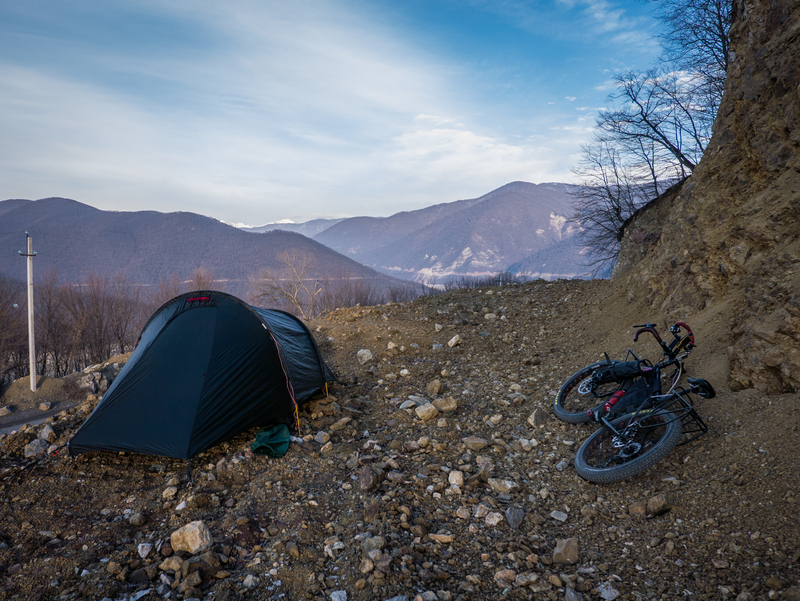 Welcome to the very first blog post for my bike journey along the Silk Road. This trip has been months (years, really) in the making, and I’m excited to share my experiences with you, my hordes of loyal viewers. (That’s a joke. I know there are only a few of you.) I’ll try to update once a week or so, with my standard mix of practical route guidance and self-effacing relatability. Or at least that’s what I tell myself to get to sleep at night. It is possible, however, that over time my wide-eyed, everything-is-beautiful tone has taken a kind of sanctimonious and self-important twist. I’m sorry if that’s the case, I just really like this mode of travel. It’s a fantastic way to see the world, and get those genuine travel experiences that us millennials apparently crave. Like pushing your 70lb bike up multiple switchbacks with trucks bearing down on you. I flew into the Tbilisi airport on the 20th of February, in a dense fog that had us delayed out of Istanbul. I set up my bike outside the airport, and was on the road quickly. 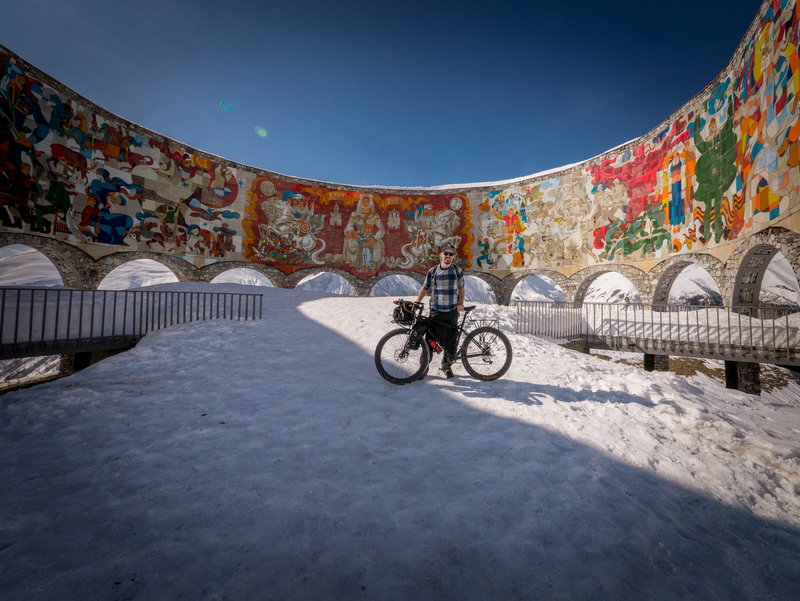 No hotel booked in Tbilisi, I wanted to make my way quickly to the Gudauri ski resort, where a friend from college was renting a room and hosting more lost souls like me. I wanted to sort of take a moment to breathe and reset before heading out in earnest. My target date for entering Uzbekistan is April 1, and I have more than enough time to make it there before that date. Not actually in Tbilisi. 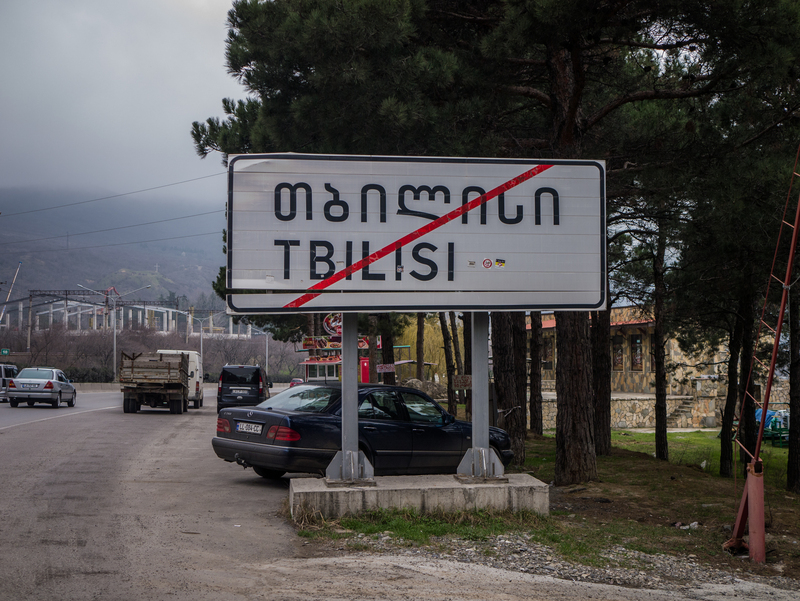 Tbilisi is worse than this. Actually Tbilisi. 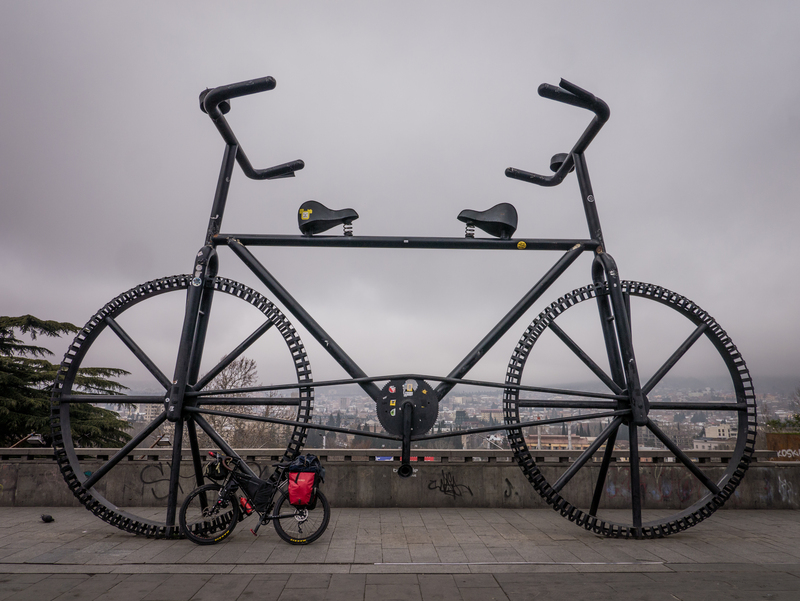 But much like Tbilisi, this bike would be frustrating to ride. Georgia is the most developed country I’ve cycled in in for an extended period of time. The thing about developing countries is that most highways are busy, but simple to navigate. Cars go slowly, and look out for things that are my size. Bikes, motorcycles, and maybe a tractor. There is often a large shoulder on the side of the road to cycle on. Not so here. Highways have interchanges, off/onramps, and cities are generally harder to navigate. Just crossing a busy street with a loaded bike becomes a challenge. Tbilisi was the epitome of those difficulties. Riding on the shoulder of a busy highway, trucks flying by. Amen. End Tbilisi. I feel you, sign. I had been planning to finally stock up on food in Gudauri, because I didn’t want to dive into any Georgian cuisine quite yet without the rundown on what calorie-dense foods I should look for. I guess I was worried that those jars and bottles of orange and black liquid sold along the side of the road were petrol, as they were in Cambodia. They weren’t. This is Georgia. They were jars of alpine honey and homebrewed wine. I will not go hungry here. In retrospect, I don’t know why I spent the first two days powering through on Clif bars and pretzels, but I can’t go back and redo it now. By the time I got up to Gudauri, two days, 140km and around 2000m of total elevation gain later, I was jetlagged and starving. The transition from long plane trip to hard two-day ride had been tough on my body. 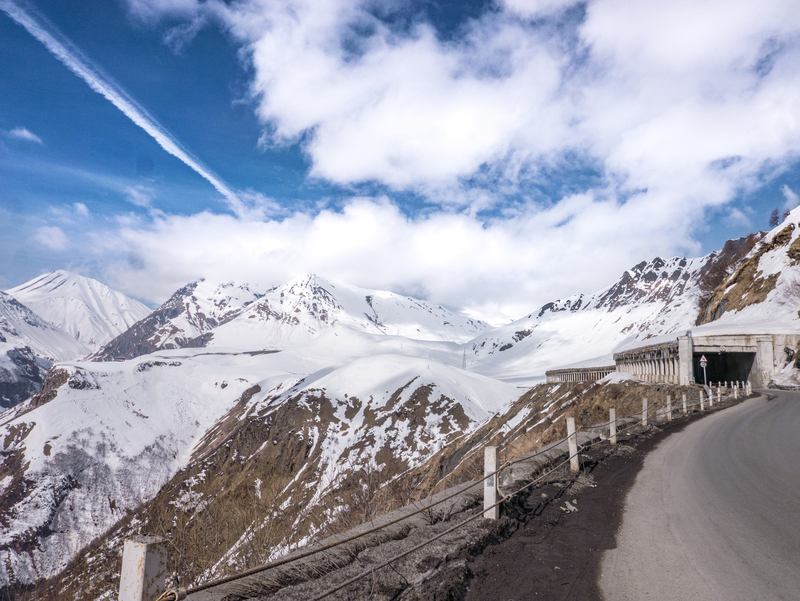 The road up to Gudauri is called the Georgian Military Road, and is one of the only roads that crosses the Caucasus into Russia. It’s a route that was first charted by Strabo 2000 years ago, but didn’t have a proper road until Russia sent 800 men up there in 1783 to build it. Oddly enough, the reason I know about Strabo in the first place was because of a history paper I wrote on Renaissance mapping in my first year of undergrad. Odd, but understandable to see his name pop up again, given what he did. 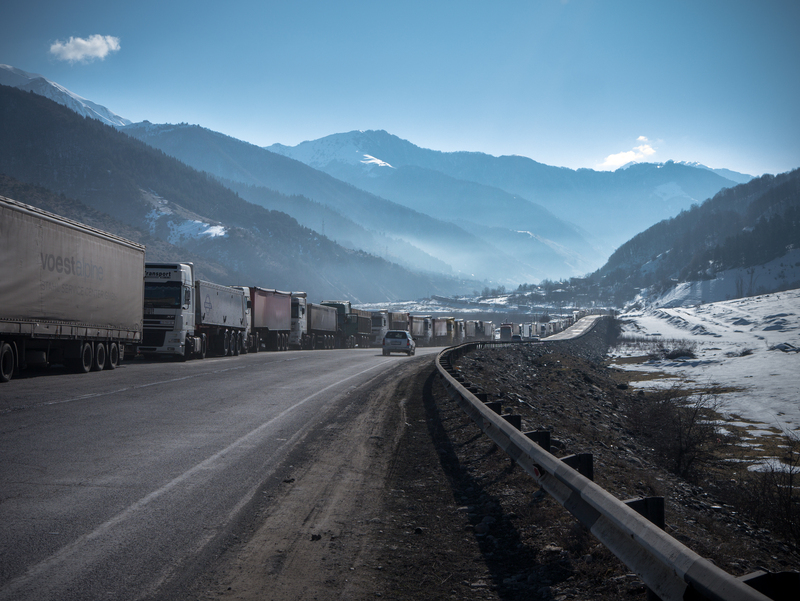 A line of more than 200 trucks, waiting at the bottom of the pass to go into Russia. The New Silk Road, or something like that. 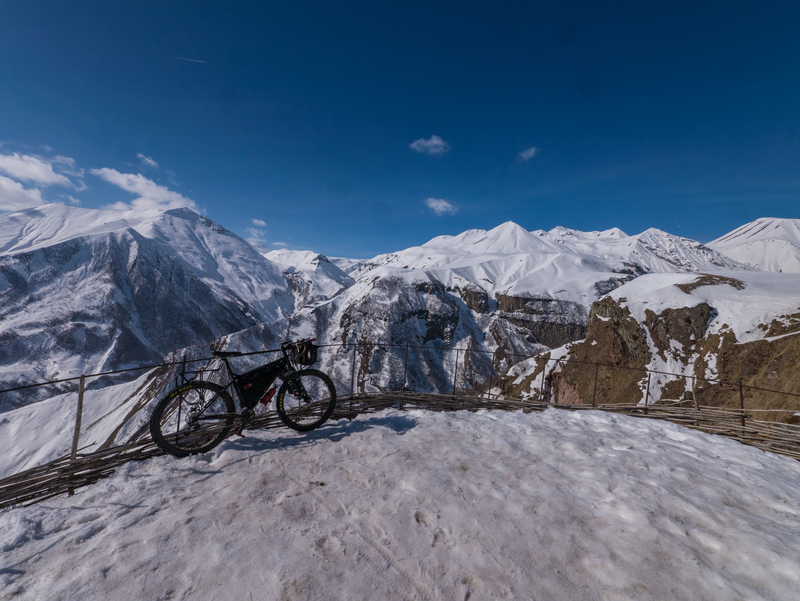 One of my days staying in Gudauri, I rode up to Jvari pass, albeit without my bags. 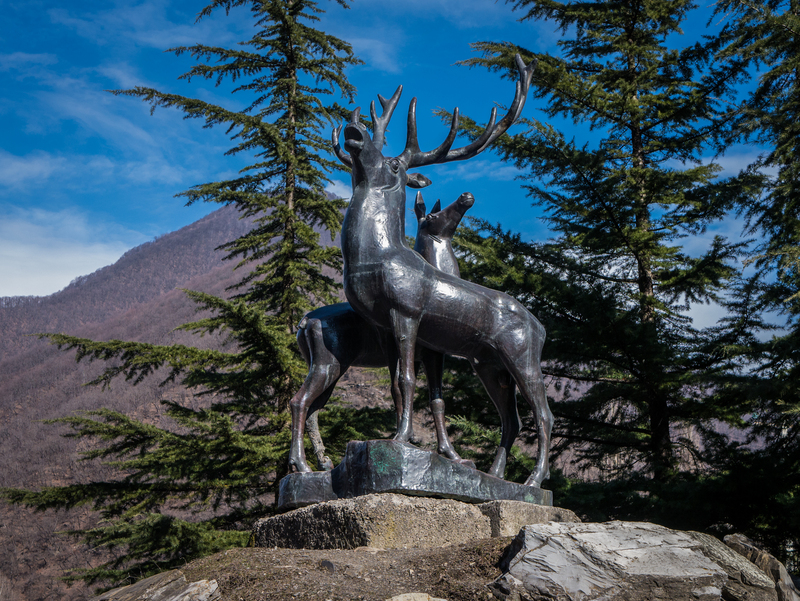 At the top of the pass, there is a Georgian-Russian friendship monument. The monument was built in 1983 to celebrate 200 years since the road was first established. Since then, the relationship between the two countries has grown complicated. The monument now faces the Russian-occupied territory of South Ossetia. I removed the bags for a day. Many thanks to Taylor Beckwith-Ferguson, who hosted me at his Vagabond Ski Base in Gudauri on this leg of the trip. It’s been awhile since I’ve gone skiing, and I never got on the slopes myself, but it was nice to spend a few days with folks who get as excited about maps of the backcountry as I do. Best of luck to everyone I met there. Finally off the pass and into the countryside. The view from camp. 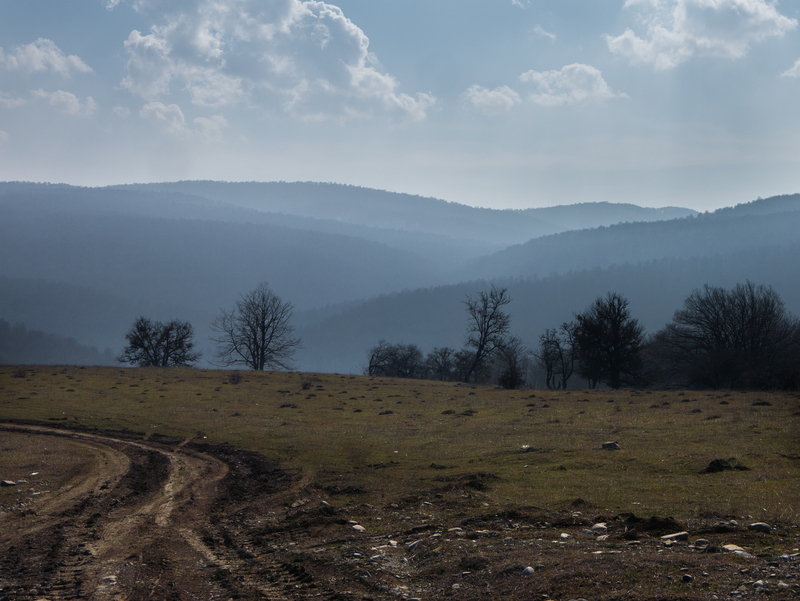 From Gudauri, I headed back down the Georgian Military Road, and into the Kakheti valley. On my way, I found my first empty gravel road. It should have been a revelation, but I was unable to enjoy it, because I was eager to finally test out the most important addition to my touring setup: a small cast-iron skillet. Before I hit gravel, I had bought some eggs, and I started riding incredibly slow, trying to keep them from breaking in my backpack. But they didn’t break, and so that’s how I found myself up a gravel road at 1300m elevation, drinking a beer and eating a bacon and egg sandwich. Perfection. Tbilisi is absolutely bonkers. The drivers (not just Tbilisi, mind you, but Tbilisi is particularly bad) are crazy. There are no shoulders or bike infrastructure. I was riding on the sidewalks for much of the ride through town. Georgians, just as a general rule, just don’t care about cyclists. They make dangerous oncoming passes even with you there, use the other lane on blind corners, or talk on the phone. Always cede the right of way, wear a helmet, don’t listen to music, and most of all ALWAYS assume that someone coming toward you will do something unexpected. When there IS a gravel shoulder on a busy highway, ride on it. When possible, use side roads. 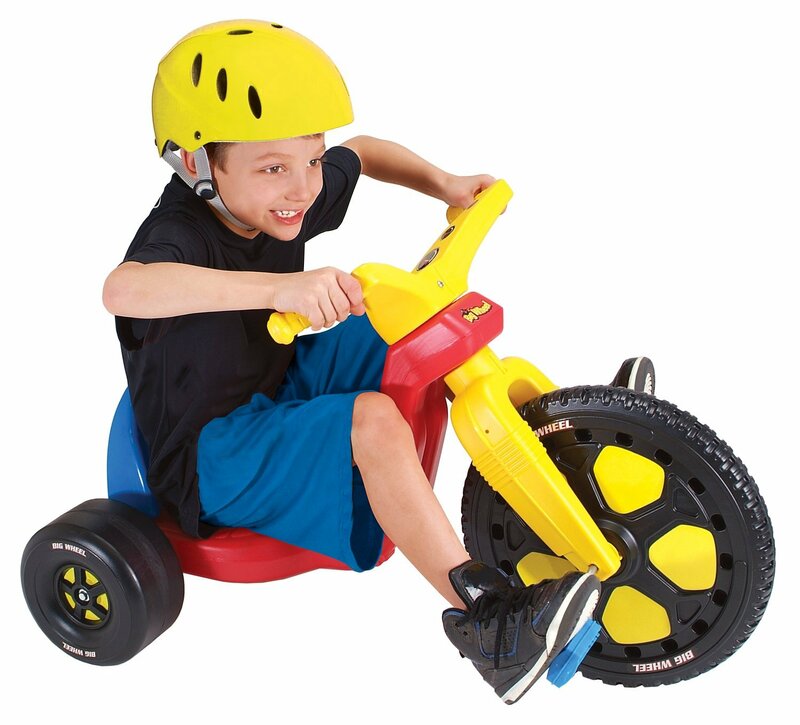 I am happy to have brought the big wheel for this purpose. It makes the gravel less horrendous. The Georgian Military Road is also stupid busy to ride on. It’s also slightly uphill for a long, long ways. The worst type of riding, by far. 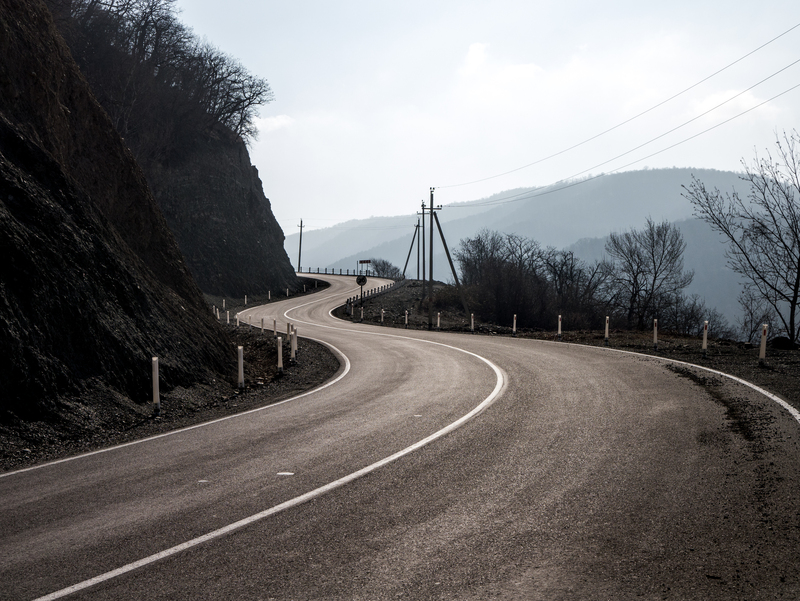 The road to Tianeti into the Kakheti valley is gorgeous, hilly, and very quiet. The dogs here are VERY aggressive, and only seem to go after cyclists. They will come running and barking, teeth bared from wherever they see you. Sometimes from over 100m away. I sometimes keep a rock on my handlebars, just in case. Lifting it in the act of throwing sometimes makes them back off, but sometimes not. I have in the past relied on a stern “NO!”, but that doesn’t work here. Neither does “ARA!”. If you stop, they generally will realize you’re a human and stop chasing you. But that doesn’t work always either. These are big, Caucasian dogs, and they are sort of terrifying with hackles raised and teeth bared. Tap water seems fine to drink and is delicious compared to DC water. It’s honestly pretty bleak up here in February. All the trees have no leaves, and the people are bundled up and not particularly welcoming unless greeted with a gamarjoba (hello). That always prompts a smile. As with literally anywhere else in the world, a few words in the local language goes a long way to opening people up to you. It’s cold too, close to freezing or below most nights. Bundle up. I now realize I may not be blogging as much as I thought I would over these next few weeks. I’m trying to see how many nights I can camp in a row without using an outlet/modern amenities. It’s going to get dirty. I’m writing in Microsoft Word, but my hotspot function on my phone isn’t working, so I can’t upload anything to the internets. (Correction: now it is. I’m updating, for the first time ever, from my tent!) But I’m here. Like a gust of wind, unseen, clinging to the edges of Georgian society. I’ll try to check in every week or so. See my Instagram for more photos and junk.